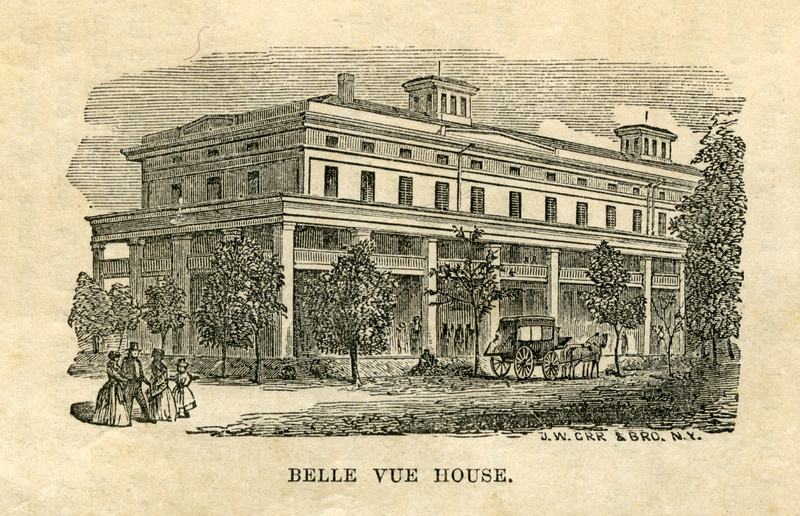 In 1828, the Bellevue House on Catherine Street made a splash as the first genuine resort hotel in Newport, helping to shape a burgeoning culture that would soon propel a new economic boom for the city. 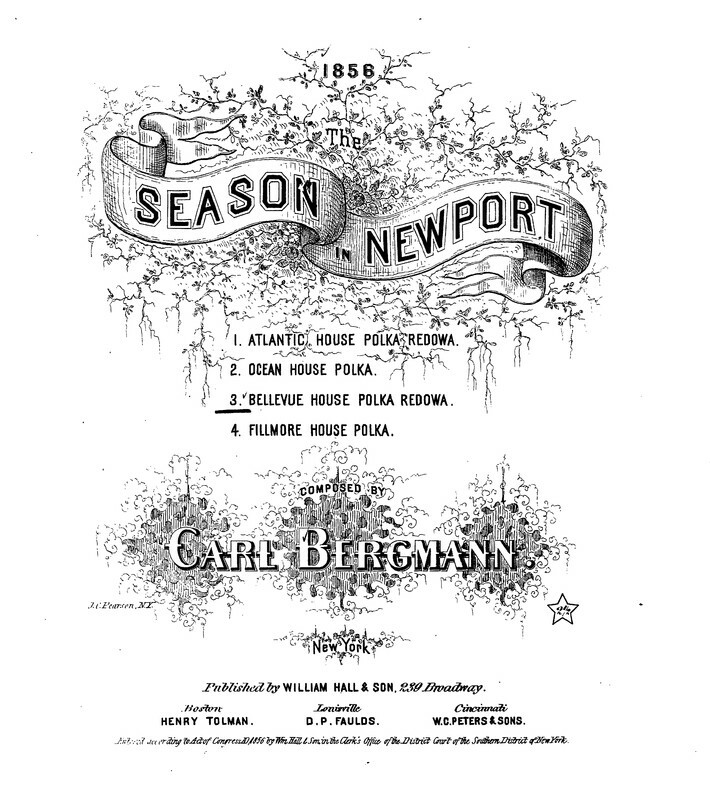 During the magical summers of the late 1840s and 1850s, newspapers described the music scene in Newport in glowing terms, with the Germania Musical Society situated clearly at the center of the experience. On July 30th 1853, during the height of the "hotel period," the Germania gave a full ensemble concert at the Bellevue House that required the cancellation of music at both the Ocean and Atlantic House Hotels for the evening. The advertisement in the Newport Daily News referred to it as, "A Grand Instrumental Concert to be rendered in the form of a Symphony Soiree." It was anticipated to be, "one of the most brilliant gatherings of the season." The concert included Mozart's Grand Symphony in G, Mendelssohn's Nocturne for A Midsummer Night's Dream, and Wagner's finale to the opera Tannhauser. The same year, the New York Daily Times reported that the Germania and acclaimed pianist Louis Moreau Gottschalk (who was visiting Newport) performed at a benefit concert for New Orleans at the Bellevue House. At the time, New Orleans was in the midst of a yellow fever epidemic. The reporter praised the Germania for volunteering their efforts and forgoing their customary, "grand concert, from which they derive the principal portion of their Summer revenue." The owner of the Ocean House, John G. Weaver, donated his share of the ensemble for the sake of the benefit. Although Gottschalk and the Germania both performed throughout the evening, it is unclear if they actually performed together. Nevertheless, one can very well imagine such a treat, especially on the dance tunes, with Gottschalk rounding out the Germania's already exceptional ensemble sound with his piano talents. Mendelssohn's Midsummer Night's Dream was highlighted that night as well as an excerpt of a Beethoven symphony. A follow-up piece in the Newport Daily News deemed the event a "brilliant affair," as "Gottschalk and the Germanians never performed better…their efforts called forth thunders of applause." The same article mentions that the event was so crowded with "beautiful ladies" and "men of distinction" that "many were unable to obtain admission." The Bellevue House Hotel: Opened in 1828, the Bellevue House was one of Newport's first grand hotels. Providing hospitality, comfort, and luxury, it was designed to be unlike any Newport had seen before. 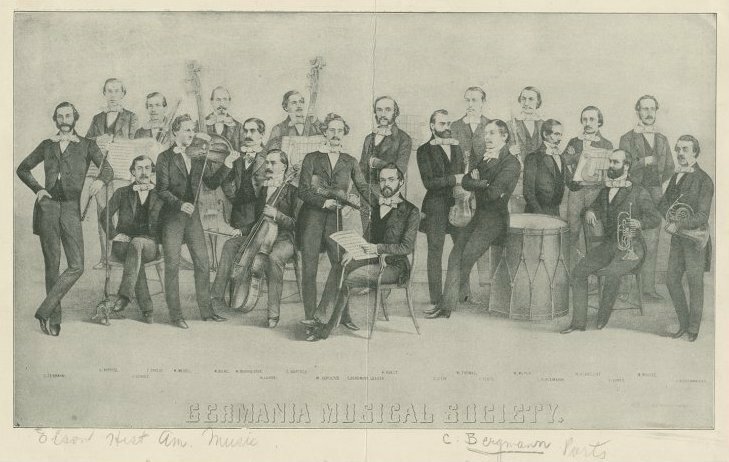 The Germania Musical Society: A group portrait of the Germania Musical Society, with its second conductor Carl Bergmann seated in front holding a piece of music. The Germania Musical Society dazzled American audiences for six years, offering nearly a thousand concerts to around a million listeners. "Bellevue House Polka Redowa" Title Page: The "Bellevue House Polka Redowa" was composed by Germania conductor Carl Bergmann and published in 1856 by William Hall and Son (New York). It was part of a series of 4 works entitled The Season in Newport, which included tributes to all the major hotels. The Germania Musical Society were known for their frequent performances of famous Felix Mendelssohn works, including the Nocturne for A Midsummer Night's Dream. Germania's first violinist William Schultze would eventually go on to perform in the esteemed Mendelssohn Quintette Club of Boston. The wonderful musicians of the Newport String Project very recently reimagined and performed many of the period pieces that you can hear on this tour, including the "Bellevue House Polka Redowa" by the Germania Musical Society's Carl Bergmann and the Nocturne for A Midsummer Night's Dream, by Mendelssohn. Learn more about the NSP and check out their performance schedule at: http://www.newportstringproject.org. 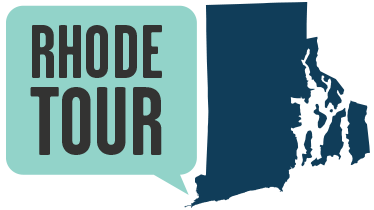 Brian Knoth, PhD, “The Bellevue House Hotel,” Rhode Tour, accessed April 21, 2019, http://rhodetour.org/items/show/337.